Oh my, this pie is divine (whoa, I’m not the best at rhyming). My husband is not a big fan of sweets (crazy, right? ), but he will eat banana pudding. I wanted to do something a bit different, so I decided to fancy it up a bit by making a banana cream pie. The peanut crust and bourbon caramel really make this pie shine. The peanut crust is crunchy, salty, and slightly sweet. I made a homemade vanilla bourbon pastry cream for the filling. Bourbon- Yum! Bananas get layered in between the pastry cream and pair nicely with the peanuts and bourbon. Let’s not forget about the caramel sauce. Oh sweet, sweet caramel sauce. Need I say anything more. It’s amazing! 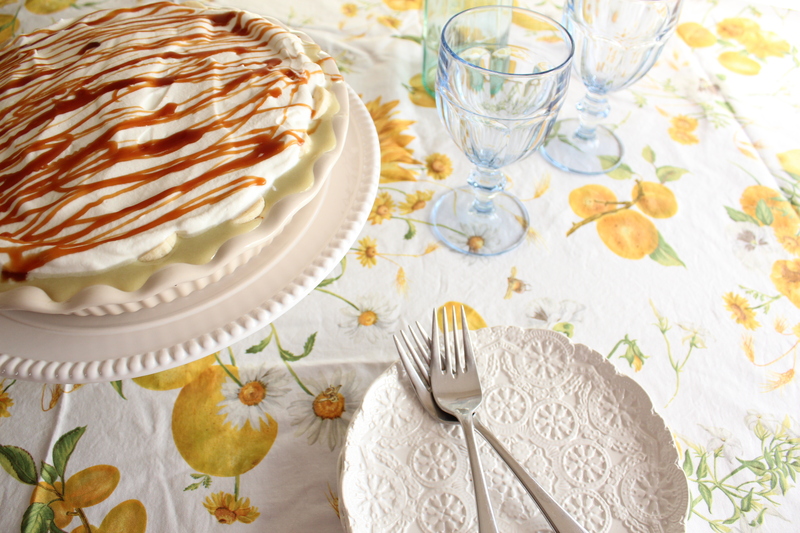 The entire pie is topped with freshly whipped cream and a heaping drizzle of the caramel sauce. My husband thoroughly enjoyed the pie. You should have seen the slice he cut for himself. It was quite large! Isn’t she a beauty? I love how the vanilla bourbon cream is creeping over the sides of the pie pan. Don’t be intimidated by all of the steps this pie requires. It’s super easy to make and the results are worth it. If you make your pastry cream the night before, the rest of the steps come together in no time. Preheat oven to 350 degrees F. Pulse peanuts in a food processor until peanut butter forms, about 2 minutes. Whisk flour, salt, and baking soda in a medium bowl. Using an electric mixer, beat brown sugar, peanut butter, and butter until well combined and mixture resembles wet sand. Beat in the egg yolk and vanilla. Gradually add the dry ingredients; beat just to combine. The mixture will be crumbly; do not over mix. Gather the dough with your hands and place in a pie dish. Press evenly onto the bottom and sides of the pie dish. You can use a cup if you like, but I thought it was easier to use my hands. It doesn’t have to be perfect because the crust gets covered. Bake for 15 minutes, or until golden brown. Cool completely before adding the pastry cream. In a medium sauce pan, scald the milk over medium-high heat (until bubbles form around the edge of the pot, but milk is not boiling). While the milk is heating, in a small bowl, stir together the sugar, flour, and salt. In a medium bowl, whisk the egg yolks until blended, then slowly whisk in the flour mixture. The mixture will be very thick. Remove the milk from the heat and slowly add it to the egg mixture, adding it a little at a time, whisking constantly (adding the milk slowly prevents the eggs from scrambling, and it tempers the egg mixture). When all of the milk has been incorporated, return the contents of the bowl to the saucepan and place over medium heat. Whisk continuously and vigorously until the mixture thickens and comes to a boil, about 5-7 minutes. At first the mixture will be frothy and liquidy, but as it cooks, it will slowly begin to thicken and the bubbles will disappear and the mixture will become viscous. Once it thickens, stop whisking every few seconds to see if the mixture has come to a boil. If not, continue whisking vigorously. As soon as you see it bubbling, immediately go back to whisking for 1 minute, and then remove from the heat. Pour the mixture through a mesh sieve into a heat-proof bowl. Stir in the vanilla and bourbon, then cover it with plastic wrap, placing it directly on the surface of the cream. This will prevent a skin from forming. Refrigerate until completely cool, about 8 hours. I made my pastry cream the night before and cooled it in the fridge over night. Stir sugar, 1 tablespoon bourbon, corn syrup, and 1 tablespoon water in a medium saucepan over medium heat until sugar dissolves. Increase the heat and bring to a boil; at this point, do not stir the mixture or it will harden. Cook until the sugar is a deep amber color, about 6-8 minutes. Remove sugar from heat and whisk in heavy cream, butter, and salt (mixture will bubble vigorously). Let cool for 5 minutes, then whisk in vanilla and bourbon. Let caramel cool slightly, about an hour, before using. Add the cream and powdered sugar to a large bowl. With an electric mixer, whip cream on high until stiff peaks form. Refrigerate until ready to use. Peel and slice three bananas. Add half of the cooled pastry cream to the cooled crust. Add a layer of bananas, then top with remaining pastry cream. Add another layer of bananas. 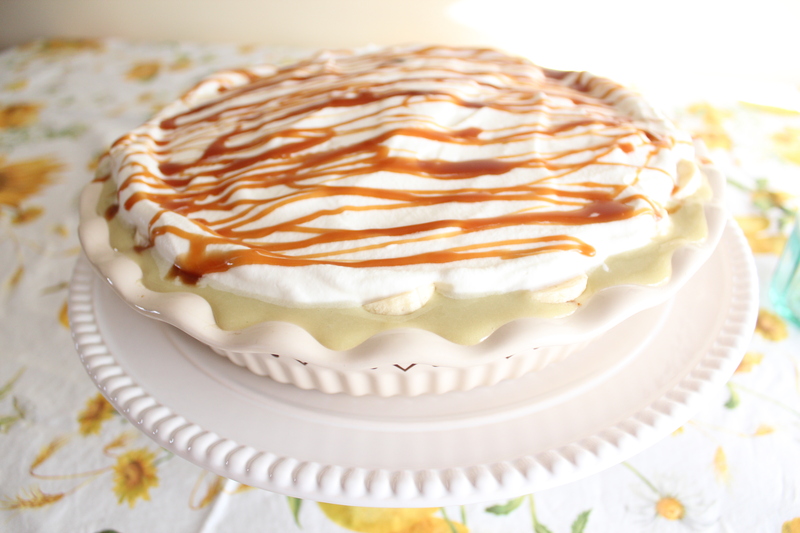 Top the pie with freshly whipped cream and drizzle with a generous amount of salted bourbon caramel. Keep in the refrigerator until you’re ready to serve. This pie is absolutely delicious; however, it doesn’t cut like your average pie. I served my pie in a pretty crystal bowl. The pie was so tasty that I could over look the fact that it didn’t stay in the form of a pie slice after I cut it. It’s rustic. Okay, I’m drooling. Now that’s really all! Thanks. It’s nice when to hear when someone is drooling over my food. That means I have done my job. I’m eating a piece as I type this. It is seriously delicious. I’m totally going to make your banana bars this weekend. They look amazing. This looks amazing! I will have to pin this to make for a special occasion. Thanks! I hope you enjoy it as much as I do. Gorgeous and mouth-watering! The drizzle is a brilliant idea. Thank you so much for sharing! Thanks so much. That sounds like an excellent idea. Oh goodness, yum. Caramel and bananas and whipped cream? Sign me up. And I adore your pie dish. Thank you. It’s a Paula Deen pie dish. I purchased it at Walmart. I love, love, LOVE banana cream pie! This looks amazing! You had me at bourbon, looks delicious! wow, this looks amazing! boubon caramel drizzle?? genius!! Thanks, Villy. Home Goods is the best place for beautiful and reasonable props. Thanks for stopping by. I’ve been on a bourbon-baking spree, so when I saw this recipe I had to try it! I made it yesterday, and this is SERIOUSLY one of the best pies to ever come out of my kitchen! I cooked the custard until it was super thick and it set quite nicely. The peanut butter crust, with the bourbon custard, and the caramel drizzle?! It’s literally too good to be true. Thanks for sharing!! Julia, thank you so much for visiting my site and making one of my recipes. I’m so glad you enjoyed the pie. I love hearing when foodies make my recipes and enjoy them. It really makes my day. Enjoy the rest of that pie! I never comment on blogs or recipes but this one is so good that I just had to. I made this last Thanksgiving. I put the pie on the table and went back into the kitchen to bring something else out. When I got back to the table it was all GONE. I had people follow me around the house and kitchen asking if I’d made another one or if I could make another one right away. It really is that good and worth all the work. 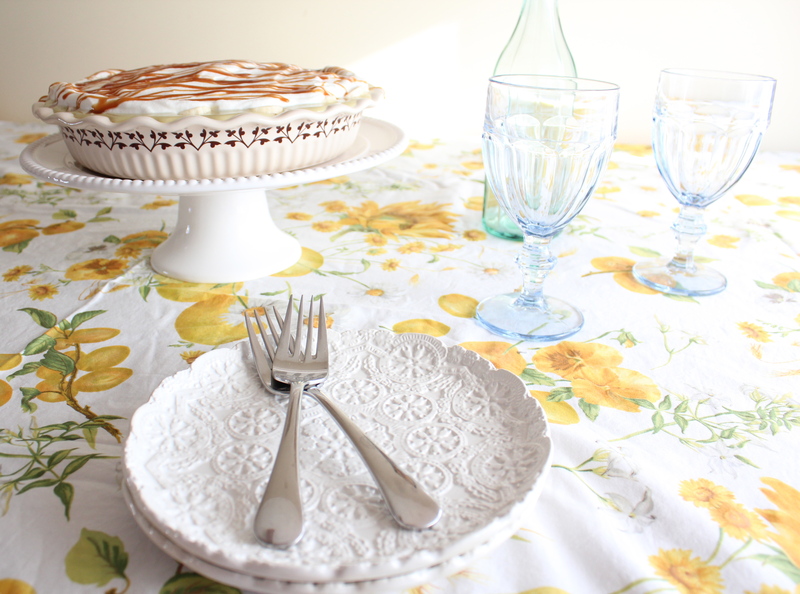 Evelyn, I’m so happy to hear that you and your family enjoyed the banana cream pie recipe. I really appreciate you taking the time to leave a comment. I love hearing from my readers. You brightened my day. Thank you! I’m making this again today and scrolled down to the comments to see if anyone has asked about the peanut butter equivalent of the roasted peanuts and came across my comment. 6 years later and I’m still making this pie. This thing deserves its own day.